Looted this from Vignette/Treasure: Frozen Treasure, summons an air spirit. 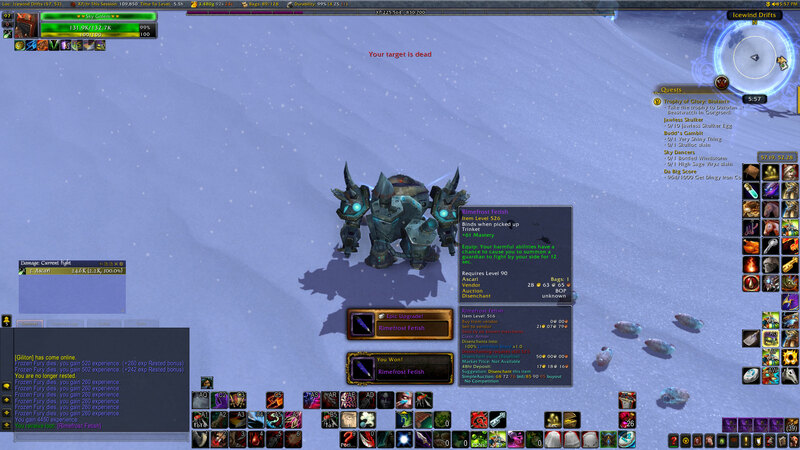 I got this as an epic 526 with +61 mastery on it on launch day from the Frozen Orc Skeleton. i got the blue (rare) version of this. Does anyone know if a rogue can proc this effect? What are the stats on the summoned elemental? Is it worth using or wouild a trinket that increases crit or int when using harmful spells be better? I levelled all my bodyguard followers to max just by standing at the location this is looted from for about three hours on my Hunter with the pet set to assist and my bodyguard follower with me. Several small, hostile elementals spawn around the Frozen Orc Skeleton, all within aggro range, so you pull aggro, then your pet & guardian kill them, with every kill rewarding +10 rep to the bodyguard (and melting the skeleton, revealing the trinket for those who haven't yet looted it). The elementals respawn quickly, so you just stand in the one spot and afk (maybe jump every 10 minutes or so) and you collect reputation for doing literally nothing, provided that doing this won't kill you. I've only tried this on a Hunter, which would probably be the class best suited for this for obvious reasons... but I'd suspect even clothies could do this easily, provided they are level 100. Just like any of the other world drops or rare mob drops, it's possible to get an upgraded lvl 526 epic version of this, just like Laliam said and you can view this by clicking normal > epic in the wowhead description. Just tried this on target dummy. Elemental is still bugged, with 8 health and level 1. For one proc it "hits" 5 times, all misses. Also proc rate is terrible. Same thing in timewalking dungeons. Just FYI that you might want to be quick on the draw for looting if others come by. I killed most of the elementals when some people showed up, then when the ice melted someone looted it before I could * sad face * Was getting used to treasure items and at least looting ability (maybe not RNG though) on rare bosses being shared, so I was kinda annoyed that happened. But it has an almost immediate respawn, so I just repeated the exercise to get it for myself a minute later. Equip: Your harmful abilities have a chance to cause you to summon a guardian to fight by your side for 12 sec.